I am lifelong resident of Oklahoma and moved to the Oklahoma City metro in 2002. I earned my Bachelor of Science degree in Dental Hygiene in 2004 from The University of Oklahoma College of Dentistry. I am dedicated to providing you with the best dental hygiene experience. 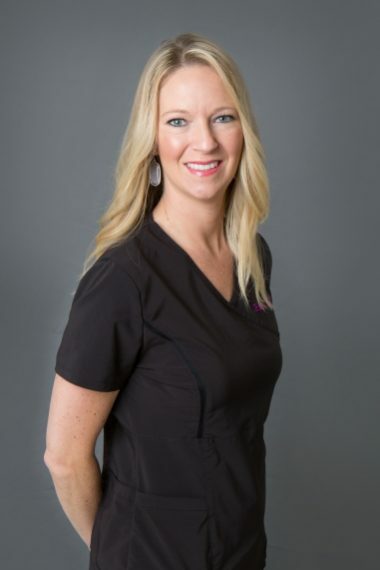 I am continually educating myself on the latest techniques, technology and dental products and am proud that the dentists at Cobblestone Park Family Dental strive for this as well. I am delighted that our practice offers the latest in x-ray, decay detection, dental and laser technologies. I am also a certified medical micropigmentologist and have been providing Oklahoma women with beautiful permanent makeup since 2007. My husband Jeff and I have two beautiful young children, Graham and Charlie. In my free time, I love going to the lake with my family, attending OU football games, and cheering on the Thunder.